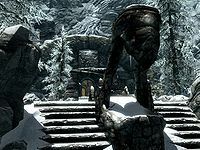 Frostmere Crypt is a Nordic ruin south-southwest of Dawnstar and just northeast of the Lord Stone. There are two zones in this ruin: Frostmere Crypt and Frostmere Depths. There are stairs leading up to the entryway. There is a fire pit with an empty pot hanging over it. To the right is a broken sideboard with a ruined book and a pair of gauntlets on top. To the right of this in the corner is an iron sword. To the right of the door leading inside are two rabbits hanging from a rack, that can be harvested and to the left is a burial urn. Upon entering, you will be at the top of a flight of stairs; if you are sneaking you will be able to overhear two bandits discussing Eisa and the stolen sword. There is a stone table immediately on your left as you enter containing a random war axe, a random healing potion and some ruined books. There are also four sacks under the table and a barrel and a chair opposite. Taking the stairs down past three more unusable barrels on your right and a pile of firewood on your left, the passageway opens out into a room containing two bandits, with plenty of sacks, crates, boxes and barrels around the room. On the left is a stone table with two chairs, where the bandits are sitting. On the table are three sacks, two bottles of Nord mead, an iron dagger and Kyr's bounty. To the left of the table is an urn. There is a gated path ahead and an open gate on the right; through this doorway will come another bandit who will probably be alerted while attacking the first two. In the second room are more crates, sacks and barrels and an apprentice-locked chest. To the right of the chest is a set of shelves containing a copy of The Song of Pelinal, v7, The Oblivion Crisis, A Dance in Fire, v1, a ruined book, a skull, a bunch of snowberries, some random armor, and two sacks. To the right of this is a table and a chair with a small window looking out into the first room. On the table is a copy of Darkest Darkness. Back in the first room to the left of the gated passageway is a pull chain that opens it. The passageway leads down some stairs and turns to the west; you will hear talking ahead and pass a large urn on your left. Just past this is a junction with a turn to the south, and an iron door straight ahead that is barred from the other side. There is a lit brazier on your right, at the junction, with a random greatsword on top of it. There is an end table on the left just after the junction with a random potion of healing atop. Taking the left turn at the junction you can see a covered walkway ahead, with a table and chair where it turns. On the table is a random dagger and a copy of Palla, volume 1. The walkway is in a three leveled room. You can see a bandit on the middle level guarding a lever. Following the covered walkway to a passageway that is running north-south, there are a couple of cages ahead with blood splattered up the wall. To the left (north) as you enter the passageway is a bandit guarding an adept-locked door; he is to the right of the door and can be quite hard to see. To the left of this door is a chair and a set of shelves holding several ruined books, copies of The Ransom of Zarek, Yellow Book of Riddles, and The "Madmen" of the Reach. Behind the adept-locked door is a storage room containing a grindstone, three unusable barrels, two food sacks, and a set of four weapon racks. There is a pair of random boots on the floor in front of the weapon racks. The racks are holding an iron sword, an iron battleaxe, and a random warhammer. Following the passageway to the south you will pass two sets of shelves, one on either side of the passageway; the one on the left holds more ruined books, a copy of Thief of Virtue and a troll skull. The one on the right has various items of crockery, more ruined books and on a plinth in front a copy of the Sneak skill book The Red Kitchen Reader. Continue into the next room which has two open doors off on this level and also wooden stairs descending to a lower level where two more bandits are discussing the theft of the sword. The first room on your left appears to be Kyr the bandit leader's bedroom. It contains an unowned double bed with an end table to the right. On top of the end table is Kyr's log. To the right of the end table is a sideboard holding a random mace and potion of stamina. Reading the log will update the related quest. There is also an unlocked chest, a barrel, several sacks, and a chair in the room. The next room appears to be another bedroom with a dresser by the door which has a random helmet on. There are two bedrolls, a table and two chairs, a crate and a food sack with a pickaxe leaning against them. On the table is Ra'jirr's note and Eisa's journal which gives you more info on what has happened. Down the stairs and after dealing with the two bandits, you will find a long table and benches in the center of the room, with another three around the room. To the east of the room is a large fireplace with an empty pot over it. To the right are a collection of sacks and barrels containing food. There is a sideboard against the south wall with a sliced goat cheese and a bottle of Alto wine on top of it. To the right is a cupboard with a couple of sacks on a shelf. Hanging above the sideboard are two garlic braids, a sample of dried frost mirriam, two pheasants and a rabbit. There is a doorway to the north with a raised wooden bridge and an unlocked wooden door to the west. Through the door is another bedroom with a bandit sitting at a table in front of you. Behind the table is a fireplace, with a wardrobe to the left and four bedrolls scattered around this part of the room. Farther into the room is a dresser on the right with a copy of Yellow Book of Riddles on top. Behind a pile of rubble is another bedroll with another bandit sleeping. Opposite this is a small set of shelves containing a medium coin purse and some ruined books. Continuing along a passageway is a sideboard on your left, which has a random healing potion on top. Just past this is the bandit guarding the lever that you saw earlier. The lever operates the raised bridge. At the end of the passageway is an imp stool fungus growth, with a partially buried burial urn behind. Back to the wooden bridge, the dropping of it may well have alerted two more bandits who come to investigate. After dealing with them, cross the bridge to a stone pillar with a spiral ramp around it leading to the bottom level. There is a sack at the bottom of the ramp and an iron ore vein under the ramp. Around the room are two carts full of rubble, several pickaxes, and a long table with a pair of iron gauntlets. There is a tunnel heading down to the west. At the bottom of the stairs you will hear two bandits talking on the right, next to a cart. The tunnel turns to the south and continues to descend. Be careful as there is a falling rock trap at the top of the stairs down. The easiest way of avoid it is to walk to the top of the stairs and as soon as you hear it activating, stand still until it finishes. At the bottom of the stairs there is a junction with the tunnel running east-west. Opposite you at the junction is a lit brazier on the ground; to the left of this is a second iron ore vein. To the east is an empty open chest, probably the one mentioned in Kyr's log as their first big discovery. Next to the chest is a pickaxe. Taking the tunnel to the west, you pass a cart on your left and then down some more stairs. At the bottom of the stairs the passage starts looking like a typical Nord burial site with alcoves in the walls for the corpses. The passageway runs north-south again; to the south is a bandit mining at a dead end. There is a silver ore vein here on the west wall. Following the passage north you will see another partially buried, burial urn and an iron door leading to Frostmere Depths. Upon entering this area you will see a forest in front of you with Kyr dying to your right. He will try and talk to you, but apart from finding out what you already knew about Ra'jirr trying to take the sword back, you learn nothing new. Once he is dead, you can loot his body. The path leads forward and you will see wisps floating around and Ra'jirr ahead being attacked by a wispmother named the Pale Lady. They will be fighting in front of a stone table which has a weapon stand on it, with a medium coin purse, a loose septim, and a filled random soul gem next to it. The table is on a stone island with water nearly all the way around it. If you follow the cave wall on the left from the entrance door, you will pass under a fallen tree. There is a skeleton that can be looted leaning against a tree with a leveled warhammer and a random shield. Continuing past the skeleton and climbing slightly to the base of the stone pillar, you will find in the northwest corner of the cave a master-locked chest. There is a stream to the right of the table. Follow the stream up to the source for an orichalcum ore vein. Crossing the stream, you come to a flight of stairs ascending to the northwest. Turning to your right, at the top you will see the word wall, which teaches part of the Ice Form dragon shout. To the left of it is a burial urn. There is a second flight of stairs up from this level, which leads to an iron door that is a shortcut back to Frostmere Crypt. To the left of the door is another unlocked chest, with a random greatsword stuck in the stone to the left of the chest (see bugs). You can find at least five blue mountain flowers, ten mora tapinella, eight purple mountain flowers, and seven red mountain flowers, as well as two torchbugs flying around. Through the iron door is a flight of stairs, with a pressure plate at the top which triggers a dart trap from the left. You can avoid all damage by stopping on the plate until the darts stop. The passage then leads to a flooded room with a bridge spanning the room and a flight of wooden steps on the right descending into the water. Under the water there is a lot to collect, including an adept-locked chest. To the south, next to a piece of fallen stonework is a sideboard with a leveled battleaxe and a random potion on it. Against the north wall in a semi-circular formation are two random soul gems, one filled, one empty. Against the western wall on a broken stone table is a random cuirass. Crossing the bridge leads to an iron door that is barred from this side; from there, you may retrace your steps to the exit. There is an iron sword and three pieces of gold on the second waterfall shelf. According to data found in the Creation Kit, Frostmere Crypt was once named Palemoon Crypt instead. You may find the greatsword floating in the air above the chest. The sword cannot be interacted with in any way or by the use of any shouts, spells, etc. However shooting it with an arrow will drop it to the ground for retrieval. This page was last modified on 17 April 2019, at 20:31.